Kate Takes 5: Playing Video Games. I watch you from my corner of the sofa. Hunched over your controller, fingers zapping and eyes shining. Golden strands of hair fall across your eyes and your jaw juts out to blow them away. Your hands otherwise engaged. I wonder to myself how many lost hours you have spent running, jumping, shooting from your fingertips. Should I be encouraging you to engage in more worthwhile pursuits? But you love it so. The screen darkens and you turn your head to me. 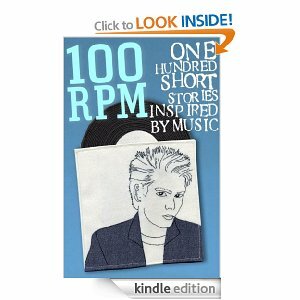 This piece of flash fiction was written in response to the wonderful Caroline Smailes, author extraordinaire, who issued an online challenge for people to write a story in 100 words inspired by songs on You Tube. I chose Lana Del Rey, Video Games and this is the result. I was beyond thrilled when it was chosen as one of the stories featured in this wonderful book compiled by Caroline and introduced by none other than Nik Kershaw! Other bands songs that are featured include The Beatles, The Cure, The Smiths, Kings of Leon, Kate Bush and David Bowie. Each story is a little gem that will encourage you to keep reading until you turn the final page. All money earned from sales will go to the charity One in Four (a registered charity which provides support and resources to people who have experienced sexual abuse and sexual violence). Every penny raised will make a difference to lives. It's also cheap as chips to no excuses - go buy it!